Apple had an unimaginably star-studded launch event for its Apple TV Plus Plus service, in which it not only revealed the details of its subscription and Apple TV Channels plans, but also pulled back the curtain on its original content plans. 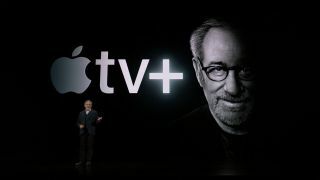 From Steven Spielberg anthology stories to Oprah Winfrey's next show, to dramas set everywhere from TV studios to a post-apocalyptic future, here’s what’s coming to Apple TV Plus. Headlining the service will be Steven Spielberg’s Amazing Stories. It's resurrecting the serialised stories of the magazine of the same name, re-imagined by Spielberg’s Amblin Entertainment, production house. First published in 1926, this will be classic story-telling in the Spielberg vein. The biggest cheer of the event came for the unveiling of a new Oprah Winfrey led TV show. The first documentary will look into "scourge and toll of sexual harassment in the workplace", while the second is set to be a multi part series focussing on mental health issues across the globe. This was in addition to a new book club that the TV legend will be running with Apple's support. Also on the way is 'The Morning Show' a ‘behind the curtain’ show looking at TV production as a workplace, with Reese Witherspoon (Walk the Line), Jennifer Aniston (Friends) and Steve Carell (The Office). Seen through the eyes of two ambitious female leads, with Steve Carell in a supporting role, it'll reveal the tensions of a high-stakes morning TV show. The onstage banter made it appear as if it will be at least partially humorous, if not an out-and-out comedy. It’s the first time Jennifer Aniston has been part of a TV show for quite some time. ‘See’ will put Alfre Woodard (12 Years a Slave) and Jason Momoa (Aquaman) in a thriller about a post-apocalyptic world in which everyone has been struck blind for many centuries, to the point where many question if sight ever existed. A quick clip made it appear a bit like Birdbox, but with future cavemen. Kinda. Kumail Nanjiani of Silicon Valley fame will lead ‘Little America’ an anthology series featuring the true adapted stories of immigrants coming to the United States for the first time. It sounds a bit crazy, with one true story focussing on a 12 year old kid left to run a motel when his parents are deported. Syrian, Iranian, Algerian stories are just a few of the cultures and nations represented. JJ Abrams (director of Star Wars: The Force Awakens) took to the stage with singer-songwriter and actress Sara Bareilles to introduce Little Voice, focussing on the trials and tribulations of a rising star. It’s not clear at this moment if it’s an adaptation of the stage production of the same name. Sesame Street’s Big Bird even took to the stage to reveal that a new pre-school show called Helpsters will feature on Apple TV Plus. Expect Sesame Street-like puppetry, with an educational focus. Will this be enough to dethrone Netflix – the only big name streaming service that appears to have been left in the cold by Apple tonight? There are certainly huge names involved. Sesame Street aside, it's lacking established franchises to bring existing fans into the fold. There's also so far no talk of feature length movies – everything revealed so far appears to be serialised content. And, of course, though a fall release date has been announced, there's no pricing yet. Will customers be prepared to sign up to yet another service? But what Apple has achieved is bringing in some absolutely gigantic industry talent to the table. If the quality of shows produced can match the names on the call sheet, we're in for some fun sessions in front of the 'ol gogglebox.